An urban multimodal transit facility serving bus and rail passengers. The Metro Downtown Transit Center was designed to accommodate the expansion of Metro bus operations in downtown St. Louis, increasing capacity from six bus stalls to twenty-two and connecting riders with existing light rail and regional bus and rail systems. This major commuter hub is considered the most trafficked transit center in the region and serves as a primary multimodal station stop for an estimated 5,000 thousand passengers daily while also serving the City’s 19,000 seat indoor arena. The design elevates the rider experience, prioritizing pedestrian safety and convenience. 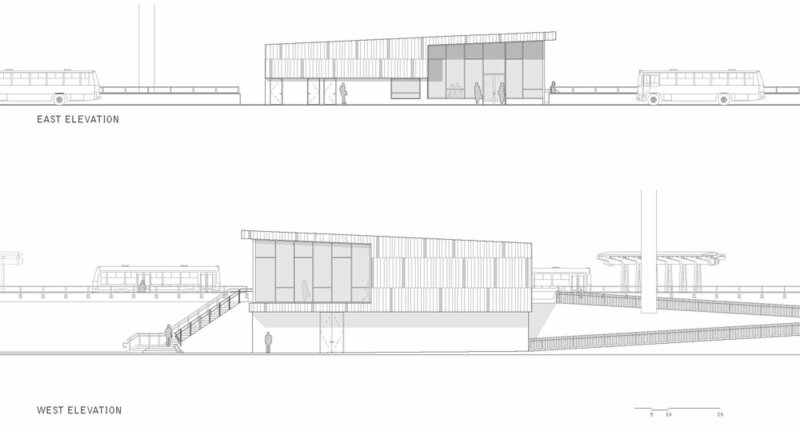 A modest pavilion building anchors the site and mediates a significant grade change between the expanded bus facilities and existing light rail station. 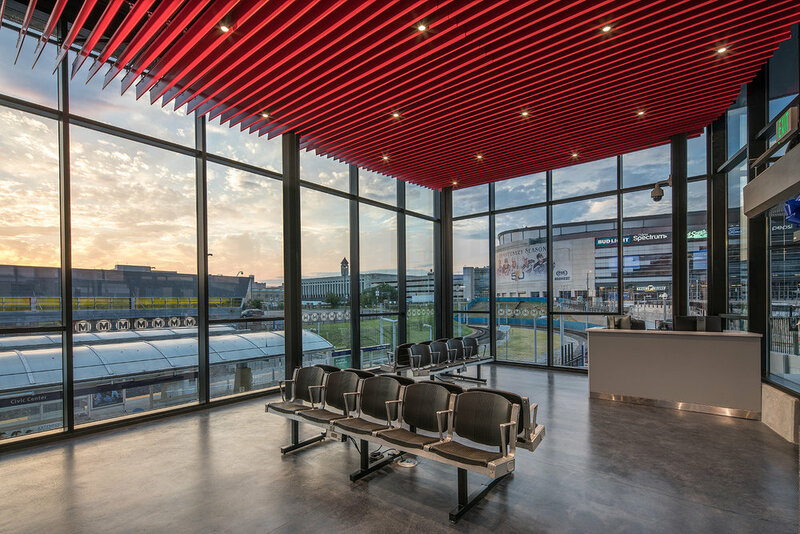 This building provides shelter and basic services for transit passengers and staff, and houses passenger and employee restrooms, transit employee offices and a passenger ticketing, information, and waiting area. The building’s form is dictated by site constraints and pedestrian safety. Its eastern side curved to accommodate the turning radii of incoming buses; its south-end determined by the set-back of the highway overpass; the west side flush to the setback of the rail line; and its north end bounded by the existing light rail crossing. 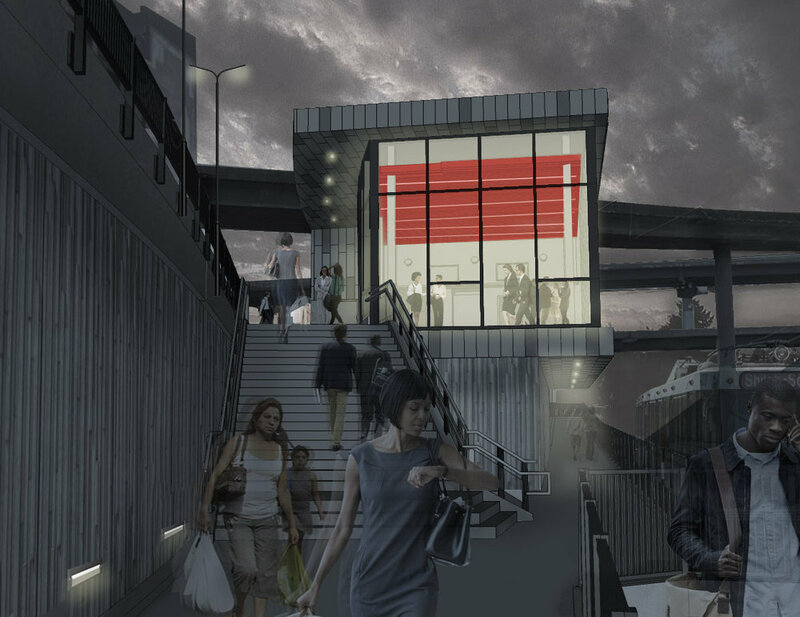 The building’s upper volume projects to allow for the safe movement of passengers and transit workers at rail level. The project’s primary materials included board-formed concrete and zinc. These were chosen for their beauty, durability, strength and carefully detailed to subtly reference the site’s historic past as a mill location.